Named after one of the foremost modernist sculptors of the 20th century, the University of Huddersfield’s new £30m Barbara Hepworth Building, home to its School of Art, Design and Architecture, will be constructed using some of the most cutting-edge BIM technology available, by Morgan Sindall Construction & Infrastructure. 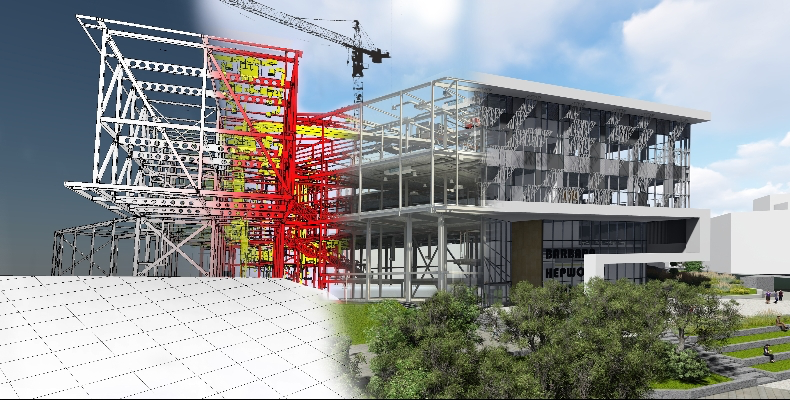 The BIM and mixed-reality technology involves the use of 3D design coordination processes, where architecture, structural and MEP 3D models are periodically combined to check for clashes and issues that could affect construction programme and costs. “By using 3D BIM models to create and validate project data, we have been able to minimise the risks during the construction process and improve the quality of the information throughout the project lifecycle,” explains Simon Taylor, design manager, Morgan Sindall Construction & Infrastructure. This includes the use of 3D laser scanning to scan existing site conditions, collecting millions of data points, otherwise invisible to the naked eye, in order to provide the most accurate possible depiction of the ongoing site. This allows the Barbara Hepworth Building project team to discover exact details of how ongoing work causes deflections to its audacious structure – without fully understanding these deflections and making the necessary modifications, it is possible that different components of the building would not fit together in the desired way, putting key elements of the build programme in jeopardy. This enables the team to adapt its plans in real time in order to ensure any issues are rectified in a speedy and efficient manner. The project team has also partnered with the university to pilot the use of Microsoft Hololens on site. Hololens incorporates mixed reality for project coordination by providing precise alignment of holographic data on the job site, allowing the project team to inspect and complete walk-throughs within a projection of the building in progress in order to undertake surveys and risk assessments of the project as it develops. It is due to be completed this year, and will be welcoming students from the start of the 2019-20 academic year.